Leading Broadband and telecom service provider Mahanagar Telephone Nigam Ltd (MTNL) today announed the launch of Ramzan and Eid ul-Fitr festival Topup Coupon 650 under its prepaid Trump mobile services (2G and 3G) in Delhi circle. On the occasion of holy Ramzan & Eid ul-Fitr festival, as a goodwill gesture, MTNL has decided to shower blessings for its customers with hyper talk time on Special Top-Up. 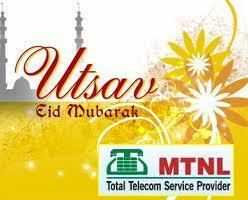 MTNL’s “Eidul Fitr special Topup Coupon 650” provides hyper talk time of Rs.786 as a core balance. The recharge will be available at MTNL Sanchar Hat in Delhi circle from 25/08/2011 to 31/08/2011. It is very difficult to recharge MTNL prepaid card. Pls let me know the MTNL site from where i can recharge my trump prepaid card easily. I have tried PAY TM it allows me to recharge only RS.50/- for Trump prepaid card.If try a recharge for Rs.100/- the message reflects that my bank Icici has rejected the transaction. If they implement such an offer, then MTNL has to shutdown !!!!!. LOL LOL LOL.